Coaching in the workplace continues to be a topic of interest. Dr. Anthony M. Grant recently published a collection of scholarly articles highlighting the significance of work in the field. 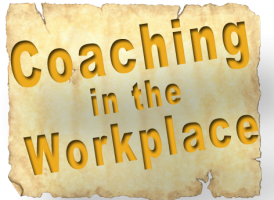 While there is no shortage of information that can be found on the topic of coaching, my 30 years of work experience tells me seeing coaching in the workplace is not common. There is a difference when it comes to coaching in the public sector. For example, public workers have several constituents that must be considered when executing their duties. Being fiscally responsible to taxpayers; being transparent to governing policies; and keeping the public workforce engaged can be challenging to the public administrator. Coaching in the workplace has the potential to address these areas of concern and many others. Coaching can be an integral part of retention strategies and communication plans aimed at increasing employee engagement. One way to understand coaching in the workplace is to discuss what coaching is not. Coaching is not mentoring. Mentors share experiences and expertise to transfer prior knowledge to situations. Coaching is not consulting. Consulting, in broad terms, is offering an expertise normally for a fee to an organization or situation. Coaching is harnessing the talents and gifts already present and guiding those talents and gifts into an agreed outcome. Coaching in the public sector can be difficult because of the inherent nature of government work. Leaders in the public sector may be uniquely suited to offer coaching to employees under their leadership. The question may come to mind, “Why coach anyone?” As a person in a position of leadership, coaching can optimize the performance of the team thereby creating an atmosphere of collaborative thinking and work. Set clear expectations that connect with the vision and mission of the organization. The leader should be able to show the team how what they are doing connects to the broader goals of the organization. Inspect what you expect. In other words, once team goals are set, establish a method to spot check the work for understanding and continued connection to the mission. Perform quarterly performance conversations with team members to ensure you are advancing something they care about while accomplishing the goals of the organization. No one wants to feel as though their desires are not being addressed. Celebrate the success along the way. Each milestone should be recognized by the leader as a positive coaching aspect of team development. Making statements such as, “great job” or “well done” have the potential to go a long way towards motivation. Let’s explore each of these quick tips in practical application. Setting clear expectations means ensuring team members understand what is expected. Check for understanding by asking each member how they might accomplish a goal. The leader is listening for action words that align with the mission and vision. Inspecting what is expected is achieved by asking team members along the way how things are going. Adjusting plans along the way if necessary to ensure that the final product is what was expected. For example, I can remember back early in my years in the navy my boss asked me to take a document and burn a copy. I thought this was an odd request. I checked for understanding and asked, “Is that what you really want? For me to burn a copy of this document?” So, after checking for understanding, I made a copy on the copier of the document, went outside and put the document on fire. Well, I was supposed to make a copy and not literally burn it. Who knew! Inspect what you expect. Performing quarterly performance conversations are an excellent opportunity for coaching for clarity. Many people have several different versions of what performance is and is not. The leader must have the conversation and share with each team member what performance looks like. Coaching from a place of sharing the vision of the organization on a quarterly basis can be very powerful. This time is essential and makes a connection between leaders and team members. Celebrating success along the way is essential for building team spirit. Communicating to the team they are on the right track moving toward a goal helps members understand what they are doing well. The leader must create ways to recognize small wins along the way. Popular software programs have task reminders built into the system so leaders can plan for those reminders to communicate success on a regular basis.